Is the busi­ness world due for a rev­o­lu­tion? That was the idea behind a bril­liant clos­ing address by Charles Handy [link] giv­en last week at the 9th Glob­al Peter Druck­er Forum in Vien­na [link]. I sensed a degree of rest­less­ness among the 400 – 500 atten­dees. The theme for the event was daunt­ing: “Growth and Inclu­sive Pros­per­i­ty: The Man­age­ment Chal­lenge of the Cen­tu­ry.” Many atten­dees, I felt, were look­ing for some­thing dra­mat­ic to be said — per­haps a whole new direc­tion for the pro­fes­sion of man­age­ment to be dis­cov­ered and announced. And, to be sure, in the mod­er­at­ed pan­els, ple­nary ses­sions, and expan­sive inter­per­son­al dis­cus­sions, there were many instances of exhil­a­rat­ing think­ing. 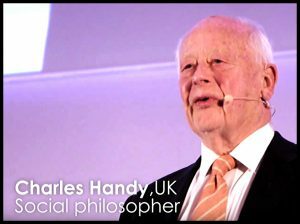 Yet the always quotable [link] Charles Handy did not dis­ap­point in his clos­ing com­ments. “I want to start by tak­ing you back five cen­turies because there is wis­dom in his­to­ry,” he opened. “500 years ago, last month, an unknown fri­ar in an unknown Ger­man town, laid a com­plaint against his employ­er. The unknown fri­ar was Mar­tin Luther, the unknown town Wit­ten­berg and his employ­er was the Catholic Church. It wasn’t a com­plaint, it was 95 com­plaints. But there were two basic the­ses, themes to his com­plaints. “The first was that to be able to buy your route into heav­en and par­adise was wrong. Yet that was exact­ly what the church was offer­ing through its sys­tem of indul­gences. A sort of pass­port to heav­en that you could buy. It was a scam. It encour­aged the poor to give what they had to make the rich rich­er. Sounds famil­iar today. Luther thought it immoral. I thought it immoral. And inde­cent and inhu­man and it still is. It took time. Great change does take time. But one man can do it. He start­ed the ref­or­ma­tion of the Chris­t­ian church­es which became, in due course, the Enlight­en­ment. Which led to the ulti­mate sep­a­ra­tion of church and state and to free think­ing, the rev­o­lu­tion in France, the rev­o­lu­tion in Amer­i­ca, the release of indi­vid­ual ini­tia­tive; and we had two fol­low­ing cen­turies of amaz­ing inven­tive­ness, cre­ativ­i­ty, and eco­nom­ic growth which end­ed up with being more pros­per­ous, liv­ing longer and more health­ily than ever before in his­to­ry — for most of us any­way. And we should be grate­ful for that. Things got worse, said Handy. Over the last four decades, those who have fol­lowed Handy’s slew of easy-to-read but deep-with-thought books know that he made the right choice. And, in the rest of his clos­ing remarks, he essen­tial­ly called for a ref­or­ma­tion in how the busi­ness world oper­ates. He essen­tial­ly called for a more human face to what is an increas­ing­ly cor­po­rate world defined by dig­i­tal tech­nol­o­gy and arti­fi­cial intel­li­gence. Per­haps the best thing about Handy’s clos­ing words were that he did not in any way put him­self for­ward as the leader of the rev­o­lu­tion in the busi­ness world. He said, at the start, that he was but a “page turn­er” in the his­to­ry of organ­i­sa­tion­al change. Instead, he said that those attend­ing the Druck­er Forum meet­ing should assume the lead­er­ship man­tle. “Let me ape anoth­er Mar­tin Luther and have a lit­tle dream. No, a big dream. “Could not the mod­ern Wit­ten­berg be here? In the Druck­er Forum. “And who is the Luther of our time? Why could it not be Peter Druck­er with his words from the grave mag­ni­fied by you, by us? And exem­pli­fy it by putting our words into prac­tice so the word goes forth mul­ti­plied by 500 peo­ple speak­ing with a loud voice in their areas, in their own spheres of influ­ence and act­ing out their words in their actions. To all of you who were not at this meet­ing in Vien­na, you can see the entire Charles Handy address via this link. To my mind, his peti­tion for major change in the world of busi­ness was not at all lim­it­ed to the atten­dees at the Druck­er Forum. Handy has invit­ed all of us to start fires where we live and where we work. And lest you feel that this is too big a task for you to take on, please heed his clos­ing words.